The Young At Heart Group (YAH) is an outreach ministry to the Senior Adult population of our church, and our community. 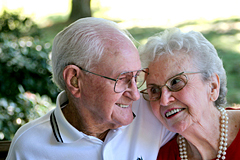 The program is geared to every facet of our Senior Adult population. Our goal is to involve as many of our number in regular activities, in order to keep everyone focused on living life to the fullest. We are truly Young At Heart. We have a morning Bible study, each month, which meets from 10:30 am to 11:30 am. Following the Bible study we go to a local restaurant for lunch together (optional). We rotate the location for lunch each month. We generally hold the cost of the luncheon to accommodate those who are on fixed incomes. A calendar of events is posted on the bulletin board in the main corridor of the church. The calendar shows all of the scheduled events for two months at a time. The YAH Group loves to do things and we always have a wonderful time together. Our main focus in everything we do is to honor and glorify our Savior, Jesus Christ. We frequently take on a special project to help a missionary family, or a needy family in our church or community. Our outreach is social in nature, but driven by The Great Commission, to make disciples as we go.